AMMONNEWS - Firefighters have saved the two main towers of Paris' iconic Notre Dame cathedral from a massive blaze threatening the centuries-old building in the heart of the French capital, according to local officials. His announcement came as Parisians and visitors gathered to watch in horror and disbelief from the nearby banks of the River Seine as emergency workers fought back enormous flames coming out of the magnificent Gothic cathedral. The firefighters were unable to save the building's spire, which was toppled by the blaze, and large swathes of the structure's roof. It was not immediately clear what caused the fire, but Paris prosecutors opened an investigation into it. At least one firefighter was seriously injured in the blaze, according to a fire service official cited by Reuters news agency. A church spokesman said the entire wooden interior of the 12th-century landmark was burning and likely to be destroyed. The fire also spread to one of the iconic rectangular towers. Those living close to the cathedral have been evacuated in case of a possible collapse of the building, Paris Mayor Anne Hidalgo said. France's civil security agency said "all means" except for water-dropping aircraft were deployed to put out the flames. But the defence agency said those were unsuitable for fires like the one at Notre Dame because dumping water on the building could cause the whole structure to collapse. "A terrible fire is under way at Notre Dame Cathedral in Paris," Mayor Anne Hidalgo said earlier on Twitter. "There are a lot of artworks inside ... it's a real tragedy," she later told reporters at the scene. Police urged people to avoid the area and facilitate the passage of emergency vehicles. French President Emmanuel Macron, who cancelled a national address due to the fire, reached the landmark on Monday evening and went straight into meetings at the nearby Paris police headquarters. "Notre-Dame de Paris in flames. Emotion of a whole nation. Thought for all Catholics and for all French. Like all our compatriots, I am sad tonight to see this part of us burn," Macron said earlier on Twitter. Al Jazeera's Natacha Butler, reporting from Paris, said she saw tears streaming down the face of some onlookers. "The cathedral is a French icon, it is a symbol of Paris all over the world," she said. "To see it in flames is extremely sad for so many people." Claire, a 15-year-old onlooker, told Al Jazeera crying: "Notre Dame is the heart of Paris and I came as soon as I heard. This is our heart and it is disappearing in the flames. What do we have left?" Mary Mahiou, another witness, told Al Jazeera there was "nothing left [of the building]". "We can see the firefighters, trying to do their best but unfortunately we don't believe that there's anything that can be done. It's really sad," Mahiou said. Yvette, a French-American student, told Al Jazeera: "I came as soon as I could because I didn't know how bad the fire was going to be or how much of the structure was still going to be standing, and I wanted to stand witness while it was still here." Nedjma, an eyewitness in Paris, said she saw the fire on her way home from work. "As we walked, we could feel ashes on our faces. Everyone was really shocked by this," she told Al Jazeera. "It's a huge monument and a huge part of Paris's history." Notre Dame is distinguished for its size, antiquity and architectural interest. The cathedral, which is famous for featuring in Victor Hugo's classic novel The Hunchback of Notre Dame, attracts millions of tourists every year. It was here that Christian crusaders prayed before going to fight in the Holy Land, where revolutionaries defiled representations of French kings and Napoleon crowned himself emperor in 1804. "It's a devastating image because Notre Dame, Paris and France play a key role in the history of European Christendom, that is second only to Rome and the Vatican," Massimo Faggioli, a professor of theology and religious studies at Villanova University, told Al Jazeera. "This is really a fire at the heart of Christianity," he added. 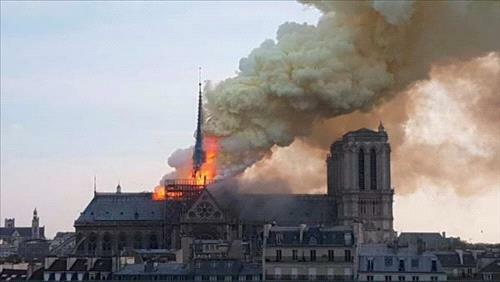 French historian Camille Pascal, meanwhile, told France's BFM television news channel the blaze marked "the destruction of invaluable heritage". "It has been 800 years that the Cathedral watches over Paris ... happy and unfortunate events for centuries have been marked by the bells of Notre Dame," Pascal said. "We can be only horrified by what we see."